Direct Power is proud to report that we have a very happy and content customer base! Unfortunately not everyone experiences such smooth sailing with their energy supplier or TPI. We know this to be fact as each year we help new clients navigate themselves out of some sticky situations while dealing with both energy supplier complaints, as well as Third Party Intermediaries (TPIs) alike. If you are unfortunate to find yourself unhappy with your current electricity or gas supplier, or have frustrations with your current TPI, why not follow the below simple steps to seek a resolution. The good news is that most concerns can be addressed before they become full blown complaints! 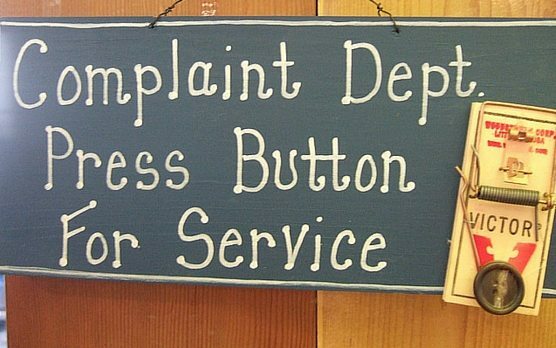 If you are unhappy with either a Supplier or TPI, contact them directly to voice your complaint. It is helpful if you keep a log of all correspondence. Include the date, time and name of people who take your calls, as well as notes on the call itself. A simple way to track your complaint is to raise your complaint via e-mail.Take the time to lay out the facts in a clear and simple manner so the recipient can understand your concern and work to resolve the problem ASAP. Suppliers and TPIs have a duty to listen to your concerns and address them in a prompt manner. Sometimes a problem may be a simple quick fix, for example, updating a bill with a correct meter read or resolving missing bills by correcting a mailing address. Other situations are more complex and may reasonably take weeks or months to resolve. Either way, the Supplier and TPI should give you a sensible time frame for complaint resolution, then they must manage your expectations accordingly, and update you on all progress. If the complaint remains outstanding after a prolonged time has passed, you could try contacting Citizen’s Advice via phone on 03454 040506 or online at at the Citizen’s Advice website. For further advice you may also seek input from the knowledgeable team at either Direct Power, or at the UIA (Utilities Intermediaries Association). Staff at both these organisations have decades of experience in the energy industry under their belt. Chances are if they have not dealt with a similar complaint before, they know someone who has and will be able to offer useful insight. When all else fails, and it has been longer than eight weeks since you first raised your complaint with the supplier, then you may seek assistance from the Ombudsman. Find out more about who they are and how they can assist directly at the Ombudson website. Hopefully the above tips give you some guidance while dealing with your TPI and energy supplier complaints. This process can definitely test your patience, but never fear, there are several organisations out there that will help you through this process if things need to be escalated!